Amends the Wildlife Code. Provides that deer hunting permits for youth hunters shall be open statewide and not limited to one specific county. Amend House Bill 5015 on page 2, line 15, after the period, by inserting "The Department shall not be liable for civil damages arising from a volunteer operating his or her own light equipment in carrying out functions granted by the Department, except for willful or wanton misconduct on the part of the Department. "; and on page 4, line 14, after the period, by inserting "The Department shall not be liable for civil damages arising from a volunteer operating his or her own light equipment in carrying out functions granted by the Department, except for willful or wanton misconduct on the part of the Department.". Amends the Wildlife Code. 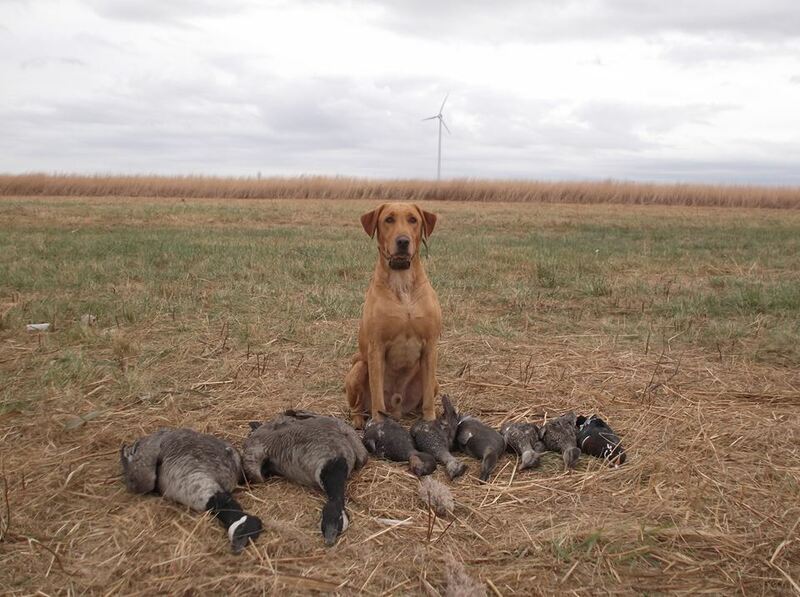 Combines youth hunting and trapping licensing. 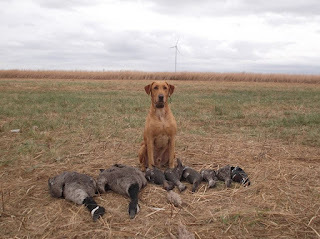 Provides that the fee for a Youth Hunting and Trapping License is $7. Provides before any youth 18 shall take or attempt to take any species protected by the Code for which an open season is established, the youth shall first procure and possess a valid Youth Hunting and Trapping License. 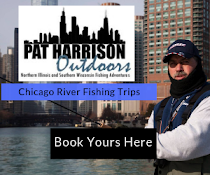 Provides that a Youth Hunting and Trapping License shall entitle the licensee to hunt or trap while supervised by an adult (rather than a parent, grandparent, or guardian) who is 21 years of age or older and has a valid Illinois hunting or trapping license. Provides that youth licensed shall not hunt or trap or carry a hunting or trapping device, including, but not limited to, a firearm, bow and arrow, or crossbow unless the youth is accompanied by and under the close personal supervision of an adult (rather than a parent, grandparent, or guardian) who is 21 years of age or older and has a valid Illinois hunting or trapping license. Provides that if a youth has a valid certificate of competency for hunting or trapping approved by the Department of Natural Resources, he or she is exempt from supervision requirements. Eliminates provision providing that before a trapping license shall be issued to any person under the age of sixteen years, the person shall obtain the written consent of his father, mother, or legally constituted guardian to obtain the license. Defines "youth". Makes conforming changes. Amends the Wildlife Code. Provides that a person may take deer with a .45 caliber or larger air-powered gun. Defines "air-powered gun" as any implement, designed as a gun that will expel a BB or pellet by spring, gas, or air charged from an external high compression power source. Synopsis As Introduced: Amends the Fish and Aquatic Life Code. 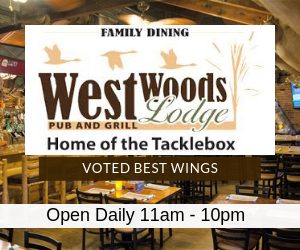 Defines "fishing license" for purposes of the Act as an electronic or physical license authorizing the person to take a certain type of fish during a specified period of time. Effective immediately. 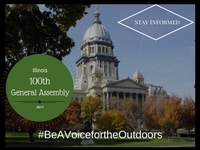 Share this with your legislator, friends, family and #BeAVoicefortheOutdoors. The change starts now! *Scroll down for pledge. Just right click and save as and let's get this pledge passed around! For far too long hunters, anglers and outdoor enthusiasts have been put on the back burner by our legislators. 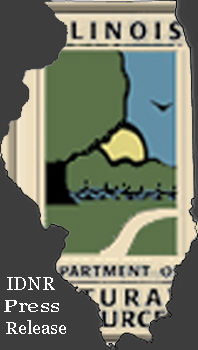 The lack of funding within the Illinois Department of Natural Resources (IDNR) has put a strain on our state parks, conservation efforts and our ability to grow as an industry. We are not going to point fingers at who is to blame. Why? 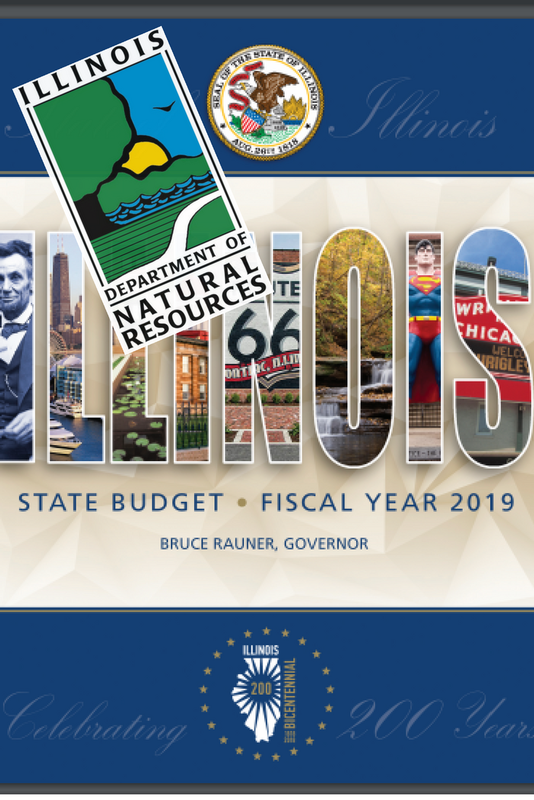 Because Illinois' Natural Resources are enjoyed by all of Illinois' constitutes; Republicans and Democrats; all races, all genders and all religions. If we sit here and blame each other, nothing will be solved. We are taking a stand to inform you, our legislators, during this election cycle, that we are no longer sitting idly by. We are sick of the excuses that we have heard for over a decade and we want action! We understand that our state is in the red when it comes to finances and there is no easy solution to get us out of it. We have heard over and over again that there is no funding available to the IDNR and we understand the politics that come into play when allocating funds. For example, Agriculture, Human Services, Pensions, Transportation and the list goes on. There is no easy fix to this budget crisis, however your constitutes that hunt, fish and enjoy the outdoors are apprehensive about the future of our state's natural resources. Legislators need to look at the IDNR as an investment decision, not an overnight solution. Just look at these two areas in Illinois; Lake Shelbyville and Rend Lake. These are two areas that have an abundance of hunting, fishing and outdoor recreational opportunities that are not living up to their potential. Don't just take our word for it, talk to the legislators that represent these areas to see what our state is missing out on. Current and past Directors of the IDNR can only do some much with the inadequate funding that you as legislators give them. Doing more with less only gets you so far. It's time to capitalize on what Illinois can offer the nation. We are home to Lake Michigan, the Mississippi River, the Illinois River and hundreds of lakes and other tributaries, you as legislators don't take advantage of. By investing in our state parks, our fisheries and our wildlife management you can increase tourism and economic development by bringing hunters, anglers, bird watchers and the like from other states. These are hunters that will hunt on our land, anglers who will fish our lakes, bird watchers who will enjoy our state parks. All of these people will buy gas at our gas stations, stay at hotels in our cities and go out to dinner at our local restaurants. We write this letter to inform you that there are options available, you just have to be willing to work with those that utilize the natural resources. Be open minded about sitting down with groups, organizations and those that hunt, fish and enjoy the outdoors in this state to see what solutions they have. These are your boots on the ground, they know the issues affecting their region or area just as well as those working within the agency. 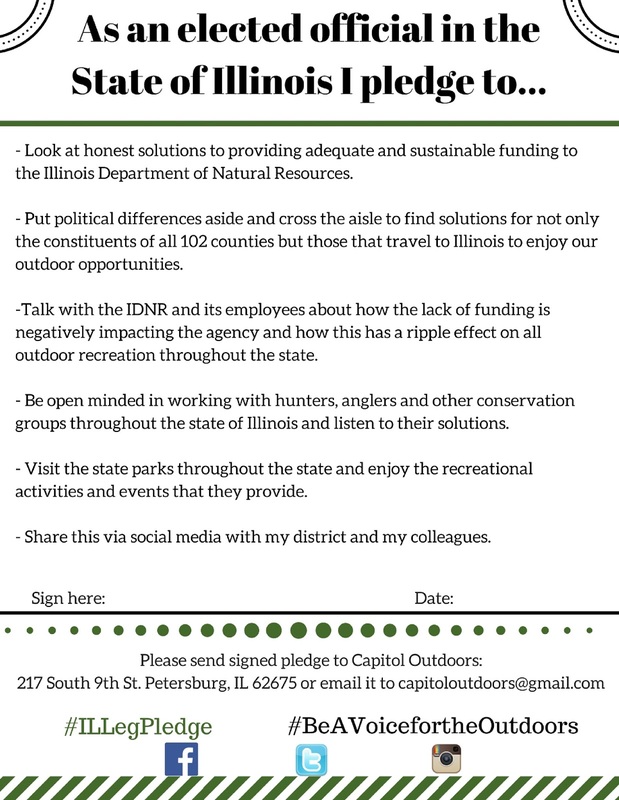 We understand that your job is a difficult one and that there is no quick or easy solution, however the days of excuses from our legislators and those of power will no longer be accepted by the outdoor community. 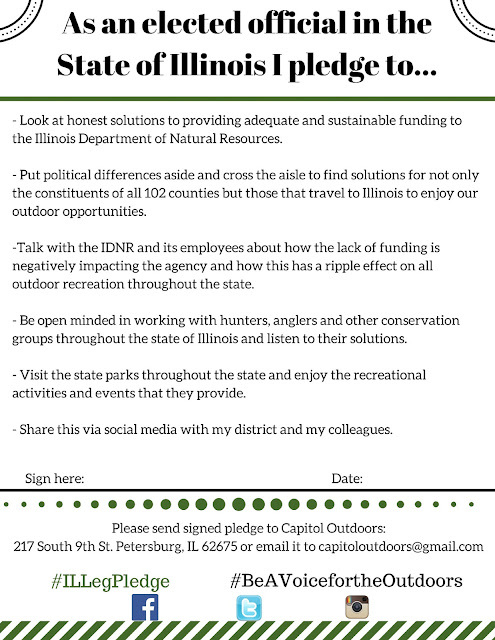 Enclosed, is a pledge that we are asking, you, as a legislator, to sign to show your constitutes; the hunters, anglers and outdoor enthusiasts of this state, that you are serious about dedicating time, energy and resources into improving the quality of state parks, conservation efforts and more within the IDNR. By signing this pledge, you are showing a willingness to be a part of the solution rather than part of the problem. Synopsis As Introduced:Amends the Department of Natural Resources Act. 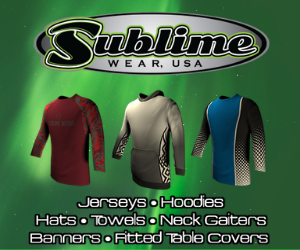 Provides that the Department of Natural Resources has the authority to accept, receive, and administer on behalf of the State, federal grant funds associated with the development or preservation of recreational boating infrastructure on this State's waterways and distribute those funds as prescribed by the appropriate federal agency. Provides that funds received by the Department shall be deposited into the Natural Resources Federal Boating Infrastructure Grant Dollars Fund and used for these purposes. Makes conforming changes in the State Finance Act. During the first year of the 100th General Assembly talks were mostly about the budget, however there were some hunting and fishing related bills that passed. Below you will find those that are effective January 1, 2018. 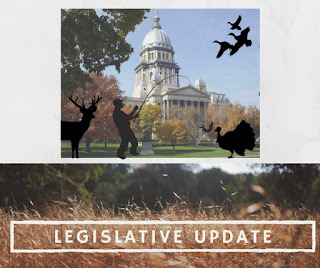 One of the major bills that passed this General Assembly was the Crossbow bill, however that became effective immediately, so we did not include that and others that had an immediate effective date. If you would like to learn more about these, click here. The second year of this General Assembly might be slow going until after the March primary then you may see things start picking up again. However, as in every election year there may be hot button issues brought up to get that recorded vote or both chambers will be quiet and contend to only issues of less controversy, only time will tell. 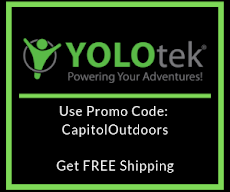 Be sure and follow us as we keep you informed from the Legislative Floors to the Great Outdoors. (Springfield, IL) Today, a new organization has joined the many others trying to effect change within the Capitol Building. 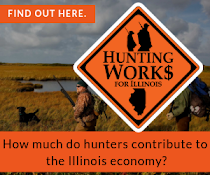 Hunting Works for America has come to Illinois creating a new grassroots organization, Hunting Works for Illinois. In December of 2016, President Obama signed the Outdoor Recreation Jobs and Economic Impact Act into law. or Sign them or they become law. Be Informed! Follow us on social media and check back often for updates! The legislative deadline for the first year of the 100th G.A. (May 31st) has come and gone. This year, the general assembly was focused on major reforms to try and combat the budget deficit and ultimately pass a budget. The political back and forth and blame game continued throughout the session and no real reform happened and unfortunately this state is still without a budget. Speaker Madigan has called for continuous session throughout the summer in an attempt to pass a budget before the June 30th deadline. In between all the budget discussions, there were in fact some hunting and fishing bills that made it through both chambers and now sit on the Governor's desk. If you would like more information on each bill, click on the link. There are still some major hot button issues that sit in either chamber to be potentially voted on. Such as the Bobcat Prohibition Bill, Lead Ammunition Ban and the Crossbow Hunting bill. Be sure to subscribe so that you can stay up to date as things happen in the General Assembly. Know someone that needs to be informed of these issues? Forward this along. Let's unite and be informed hunters, anglers and outdoor men and women! There's been movement on the Illinois Senate floor. All these bills have passed both the house and senate and now wait Governor Rauner's signature. With the legislative deadline approaching what else will come up for a vote? Stay informed by following us.